Destroy the bricks with a ball to reveal the secrets of ancient Egypt! Egypt Ball was available as a giveaway on November 24, 2018! The good old genre of tank TDS is now in a new, improved quality. Modern pixel art, amazing sound design and gameplay. Exclusive offer from Giveaway of the Day and MyPlayCity! No third-party advertising and browser add-ons! 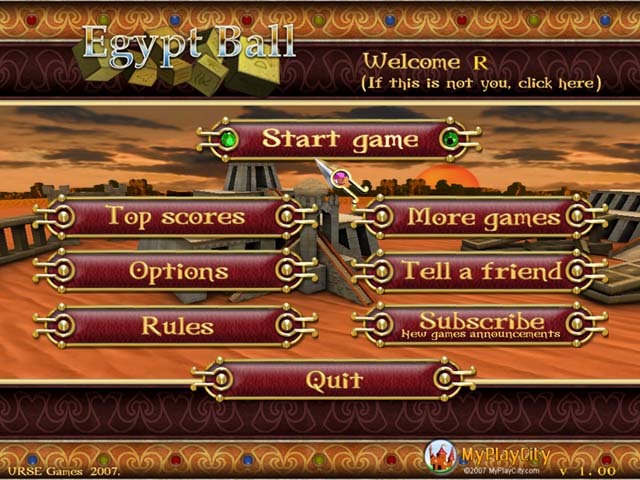 If you are looking for a challenging, exciting and colorful game with interesting twirls of the plot - you are welcome to Egypt Ball! 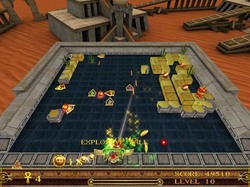 Your mission in the game is not only to destroy the bricks with a ball but to reveal the secrets of ancient Egypt, unveil codes and complete the mission with the best time. Your strikes must be accurate, and then your game process will be most efficient. Egypt Ball combines catching, shooting and points scoring thus letting all your skills become evident. Catch the gems as they give you extra points. The amount of bonuses available in the game is amazingly wide! How would you improve Egypt Ball? Play Facebook games in your browser without logging in. If you are looking for a challenging, exciting and colorful game with interesting twirls of the plot - you are welcome to Egypt Ball! The game is specially developed to satisfy the most exquisite taste of a gamer! Levels are diverse, moves are extremely swift, the difficulty level is increasing. 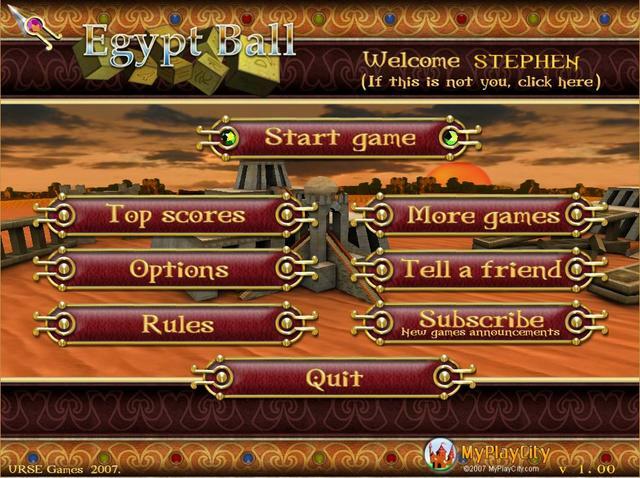 Egypt Ball is something incredible - an arcade with a puzzle core. Your mission in the game is not only to destroy the bricks with a ball but to reveal the secrets of ancient Egypt, unveil codes and complete the mission with the best time. Your strikes must be accurate, and then your game process will be most efficient. Don't yield to the easiness of the game - it's not that simple. Egypt Ball combines catching, shooting and points scoring thus letting all your skills become evident. You are given a ball - the color is important as it provides you with additional strength. You are to move and destroy the walls that cover the gems and other treasures of ancient civilization. 20 gold coins gained, and you've got one more life. Catch the gems as they give you extra points. The number of bonuses available in the game is amazingly wide! You can slow down the balls, expand your bat, speed up and get an anvil for better strikes. Next level will show you even more challenging puzzles, as well as more, desired extra skills and equipment: safe rays, darts fire and fireballs thrower, a multicolor ball that always helps you to get rid of various bricks easily. Mega laser - oh, you'll enjoy it! What can be better than to be better equipped when you are starting a new mission. Nothing can scare you - go ahead! 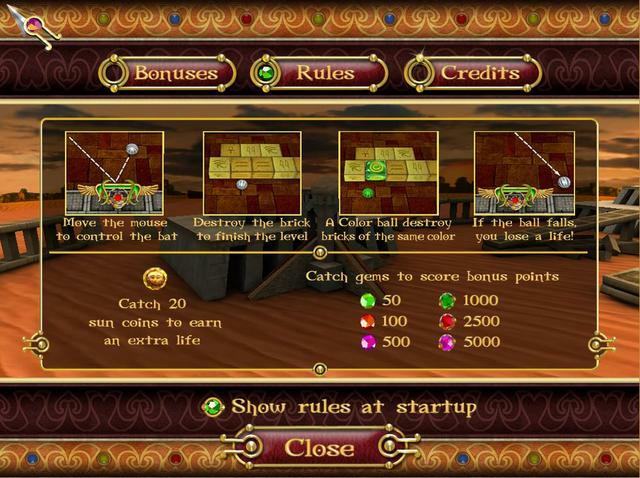 Egypt Ball is basically a cut down version of Gem Ball: Ancient Legends, which we were given 11 years ago (March 2007). 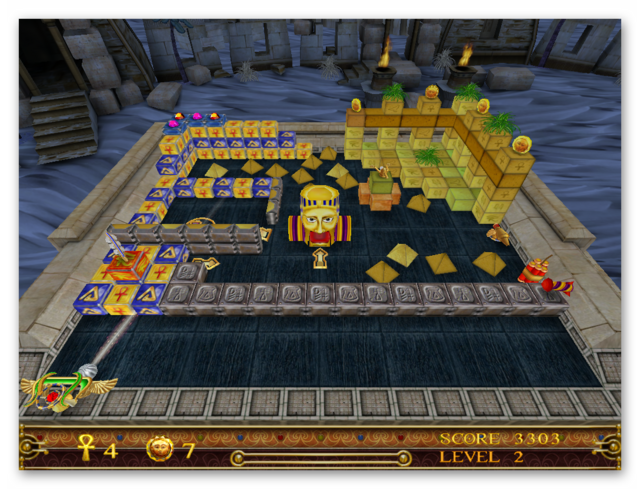 The level design is exactly the same; the main differences are that Gem Ball has three difficulty levels and two modes, Adventure and Arcade. 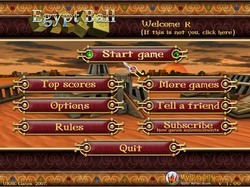 Whereas Egypt Ball only has one difficulty setting and one mode, which is the Arcade part of Gem Ball. You can get Gem Ball totally free via FreeGamePick HERE. FreeGamePick does the same as MyPlayCity with respect to your browser opening when you first install the game and when you close the game down. There are no toolbars installed. I've checked back to when it was originally given away (March 14th, 2007) and have reposted my original comment. 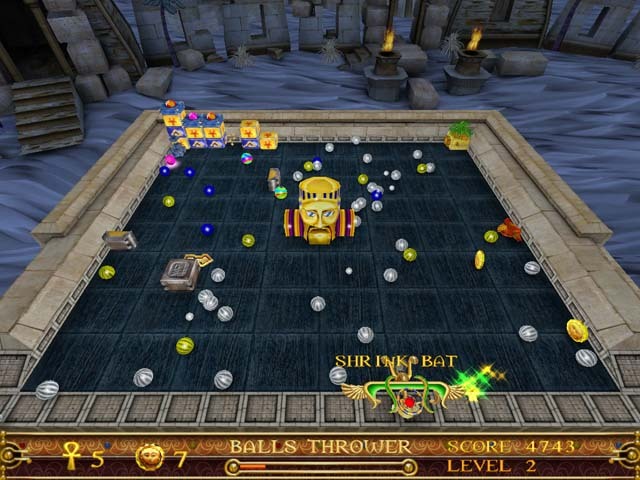 I've also checked images of Gem Ball via Google images and can confirm that today’s game has the same level designs from the arcade mode of Gem Ball, the same power-ups and the same graphics. The only things different are difficulty levels and the adventure mode has been removed from the original game then repackaged as Egypt Ball. Apart from those changes, this is basically the same game as the one we were given 11 years ago, so to save time I'm going to repost my original comment with some slight changes and include additional information about the game. Egypt Ball has the usual number of decorative bricks of different types used in the construction of the various levels, there is also a wide selection of balls that can help in varying degrees. Some balls will only destroy bricks that match their colour; others can destroy every type of brick with or without the help of an explosion; while there are also special balls that destroy everything in their path, including walls or other seemingly permanent obstructions, or have the ability to fire arrows in every direction. 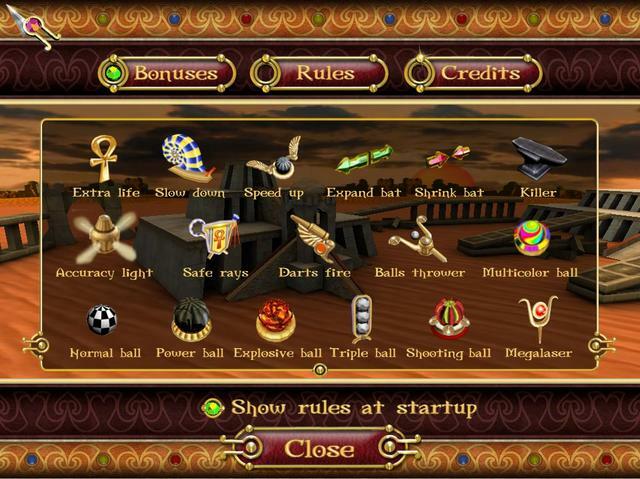 Egypt Ball has its fair share of power-ups and other goodies. The power-ups fall at regular intervals and include extra lives, those that enlarge or shrink your paddle; allow you to hold and aim a ball at a specific spot and triple the number of balls currently in play. There are also useful brick breaking weapons added to the paddle such as the Darts Fire and Mega Laser. Some power-ups affect the ball as mentioned above; for example, the explosive ball, power ball, multicolor ball and shooting ball. With Egypt Ball, you can have so many balls in motion that it can become rather confusing and makes for hectic paddle re-alignment. In such cases as this, it does help that the balls in Egypt Ball do not react when they meet each other. Rather than be deflected and change directions, they continue on their normal path. Personally I would have liked to have seen an option where you could turn deflections on, or include deflections between balls in a separate difficulty level. As well as the variety of power-ups that are released by destroyed bricks, you can also collect jewels and gold coins. 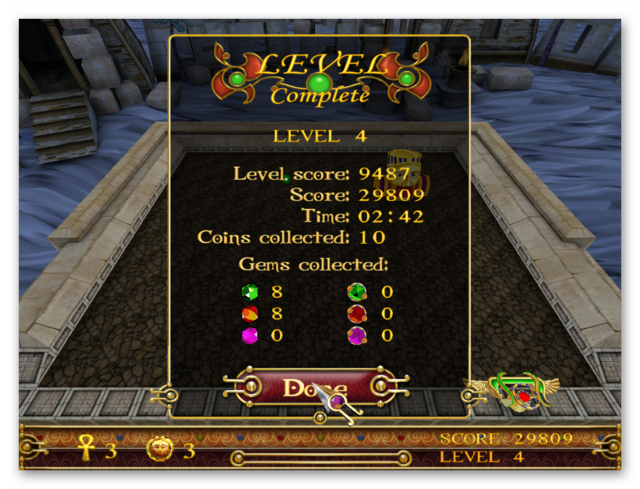 The jewels add to your score, depending upon the type, while an extra life is exchanged for every twenty coins you collect. Another way to gain an extra life is to catch the Ankh (a key-like cross symbol) when it becomes available in some of the scenes. One feature of Egypt Ball that should surely appeal to many players will be the Mega laser. This weapon appears just before a scene is denuded of bricks. It allows the player to quickly destroy any remaining items or continue using their skill at controlling the ball to finish off the job. You can see several in-game videos of game play HERE, HERE, HERE, HERE, HERE, HERE & HERE. The last video is of Gem Ball: Ancient Legends. I’ve included this to show you the similarities between the two games. As mentioned above. They both have the same level designs. The only differences being the two difficulty settings and the two modes of play in gem ball compared to the single difficulty and single mode in Egypt Ball. You can see Gem Ball HERE. After you've had an opportunity to play today's giveaway please take a few moments to give some positive or negative feedback; for example, what you liked or disliked about the game, or how it could be improved. If you don't like the genre at all, please explain why and if any, what improvements would change your mind? If you don't have time to post a comment today, please do so at your convenience, thank you. If you wish to post a review or comment about the game later, you can access the comments section by going to the game giveaways home page, then scroll to the bottom of the page where it says Archives and select the date the giveaway was live (giveaway days are in bold type). This will open the appropriate page for you to post your comment or review. Alternatively, you can google the name of the game and include Gamegiveawayoftheday in the search. This should give you a list of links to whenever this game was given away. If you miss today's game giveaway you can always get the game via MyPlayCity 24/7 HERE; or If you prefer to purchase the game you can get the better version i.e. Gem Ball HERE via Big Fish Games. If you're having problems installing or activating or getting Egypt Ball to work please visit the FAQ's Thread HERE. 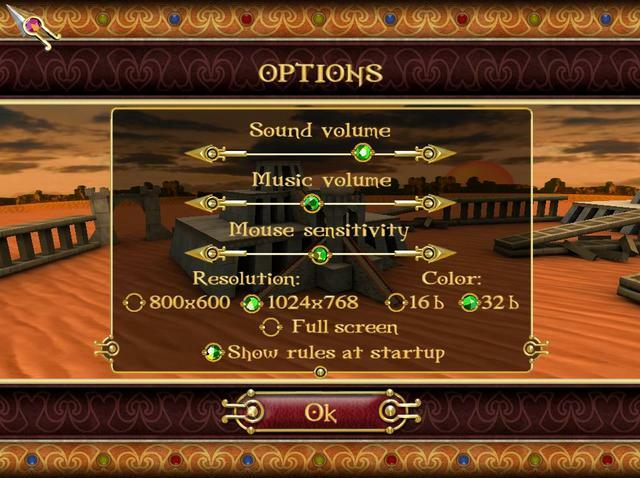 The game is over a decade old, and was created with the older Windows platforms, so try going into compatibility settings and adjust some of the settings. If you are using a recent hi-res monitor, reduce the resolution via the check boxes, change the operating system to XP and check the run as Admin checkbox. Hopefully, that will cure any issues. Also read through the communities comments including the ones I’ve linked to from when this game was given away 11 years ago because sometimes fixes have already been posted, for example, a common issue seen since the Themida wrapper was introduced three years ago is that some community members installation of the game are blocked by their security because Themida code has been known to hide malware, (usually an error message is flagged for example 'The executable is corrupted' even though in reality it is not); so as a precaution some anti malware programs will block and even delete the suspect installation files even though the files (i.e. the setup, read me and setup.gcd files are actually totally free from malware. This issue can be solved either by rebooting your computer in safe mode with networking or a quicker method is to temporarily turn off your security software to allow the installation. You could also try whitelisting the setup.gcd file. In the almost 11 years this game giveaway site has been operating there has 'never' been a game given away that was infected with malware. I'd like to take this opportunity to thank MyPlayCity for giving away Egypt Ball and also to the game giveaway team, as always, for securing other ways to get free games. If Egypt Ball doesn't interest you, but you still hanker for something new to play, you'll find details of some game deals whether they be sale items, indie bundles or games being given away for free HERE (I've not updated the thread in a while, but most of the links still take you to the latest deals). The rest of the information that used to be posted in the game review can be found in the forums HERE. Finally, check out Delenns threads for details of other free games and offers HERE and elsewhere in the game discussion forums HERE, (usually on the first page of the game discussion forums). Downloaded quick and installed just fine on Windows 7. Graphics are fine on my wide screen and all the action is easy to see. Play is entertaining. The difficulty level is set at medium. I'm on level 7 and play is fun and not too difficult to be enjoyable. Watch out for the Anvil!!!! I went to the link to download the other version and got a warning from Norton and a delete file. I am happy with the version offered here at the safe GOTD. Ok Window10 x64 Pro. Based on old fave version, new bells & whistles. Second level took a second try since still adjusting to mouse sensitivity setting slider. Once get used to the bat (which can be make wider for a while if catch right ball) then seems less 'sticky' like in original. Toward end of a level things like a mega laser can be a prize to help nail one of the remain bits that's in a tight corner. Build up your lives just in case a level gets really tricky. Megacolor ball helped on Level 2 beginning. Get it into the rear and then those metal walls can be knocked down. That was a tough start early on. Much updated fun for me anyway. Liked that center 'guy' that spits the balls in new directions. Will just play a level here or there. Felt so good finishing the original. Thanks GOTD. i downloaded, installed and nothing. i can find the game no where on my computer. i've checked all my files, even my external drive, all for nothing. Hi Marie, did you read the readme document? The game is protected by a wrapper that contains Themida. This sometimes causes your security software to block the installation because Themida code can also be used to 'wrap' malware. The giveaway team has never given away an infected game in the 12 years they have been operating. If you temporarily turn off your security, install the game, then turn it back on. you should have a working game. hope this helps. If the issue still persists check the FAQ's thread, which i link to in my review above. Hi Krysgile, The game is protected by a wrapper that contains Themida. This sometimes causes your security software to block the installation because Themida code can also be used to 'wrap' malware. This often then results in a corrupted message being displayed. The giveaway team has never given away an infected game in the 12 years they have been operating. If you temporarily turn off your security, install the game, then turn it back on. you should have a working game. hope this helps. If the issue still persists check the FAQ's thread, which i link to in my review above. Hi Susan, Virtually all of these 3D breakouts are relatively slow and easy. the main difficulty with this game is the metal bricks that tend to restrict what you can hit close to the bat, so if you've collected a speed up ball, then you may lose the ball easier. however, if you avoid those power-ups that speed up the ball, i.e. the one with wings and collect the slow ball power-up i.e. the snail. You should easily get through the levels. I would still recommend the original Gem Ball. I've installed the version from FreeGamePick and get no virus warnings unlike Suzanne, who got a warning via Norton. norton is notorious for giving false positives. norton used to be a respected name, but since it was bought out a decade ago, it's become a joke. FreeGamePick has been around as long if not longer than MyPlayCity and is basically the same type of download site, with similar low-level adware included, which only opens your browser to the download page so that the developer of the game is paid via adverts. Nothing will affect your computer. I did download Gem Ball, and found it quite easy on the easy level. ;) I prefer the added story line that the Adventure mode gives, but I'm sure I'll eventually play the Arcade version as well. Very nice game, the levels only take a few minutes (some less than 2!) so a great option for taking a tiny break here and there. Thanks to Game Giveaway and GamePick and your good self! I did download Gem Ball, and found it quite easy on the easy level. ;) I prefer the added story line that the Adventure mode gives, but I'm sure I'll eventually play the Arcade version as well. Very nice game, the levels only take a few minutes (some less than 2!) so a great option for taking a tiny break here and there. Thanks to Game Giveaway and GamePick and your good self! The game is around 13 years old and at the time of its release was actually a good looking game. If you read the specs it does actually say win 95 is acceptable. Graphics are not a decent measure of how good a game is. The graphics were written for monitor sizes at the time, so they don’t look great now on 1920x1080 resolution. I found this game boring because a level can take 7 to 8 minutes. For at least 5 minutes of that you’re watching the game – not playing it. This is because all the bricks you have to break that are facing you are metal so you have to move the ball around them and then the ball will aimlessly bounce around inside these metal structures and in this time you do nothing but watch them and catch or dodge the occasional thing coming your way – I wasn’t always sure what to catch and what to avoid. Having all this metal also makes the game unnecessarily difficult because all the parts facing you are metal that the ball will bounce off – this means you’re rushing / struggling to catch the ball when it’s bouncing against the metal to get it behind the metal blocks where you become a spectator again. I gave up on level 5. Thank you for your feedback Kermit. I agree those metal bricks do extend the game unnecessarily, but conversely, they do make the game harder to beat; which, for breakout aficionados may be a good thing? 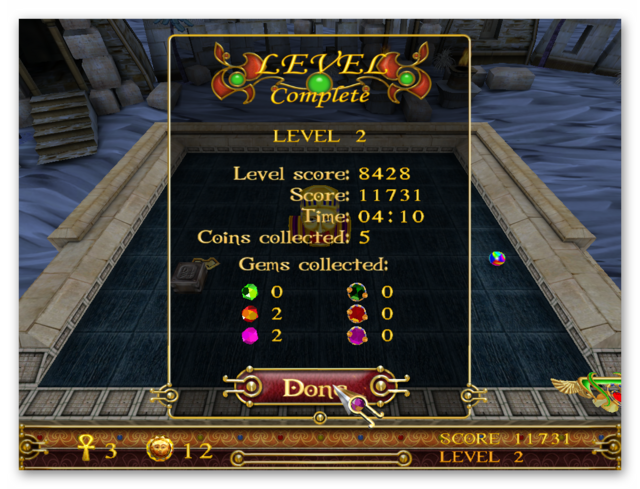 That said, I would recommend the updated version of this game Gem Ball: Ancient Legends. I've included a link to the download in my review above; the game is a FreeGamePick game and has the same adware as MyPlayCity with no toolbars. You can go directly to the download page via the link I've included in the above paragraph. With two modes (Adventure and Arcade) plus three difficulty levels, it's a much better version of the game. 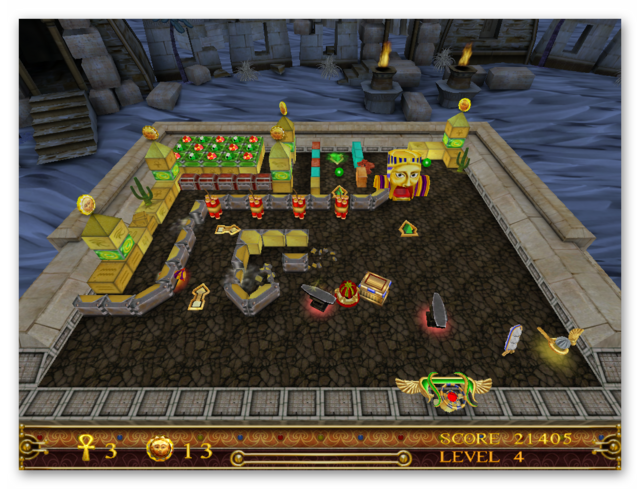 Egypt Ball is basically the arcade part of Gem Ball. I don't know why Erse Games decided to release two versions of the game unless Gem Ball was an upgraded version of Egypt Ball? Downloaded fine, but when I click on it to play, it tells me that I need to download Direct Play to play a different game. Then I get an error message. Protect your privacy from spy hidden camera lenses. Unlike traditional Ludo, Modern Ludo modifies the game rule to make its suitable of mobile device and more excited.